CEDR takes great pride in helping practices develop and implement strategies that can be used to enhance the workplace environment. We also create and maintain Employee Handbooks that ensure your office is compliant with state and federal law. Q: How long have you been with CEDR? A: I started with CEDR in January of this year (2018). I absolutely love working for this company! Our motto is “Better Workplaces Make Better Lives” – and we practice what we preach! Everything that we teach our members is something that we practice ourselves. That is how we know that we can help our members create excellent working environments. Q: Can you tell us how you got into dentistry? A: While I take great pride in sharing legal knowledge, I most enjoy working with members on matters where answers are not cut and dry. These situations present the perfect opportunity to help our members create a better workplace and office culture. Q: What do you enjoy about working with AADOM? 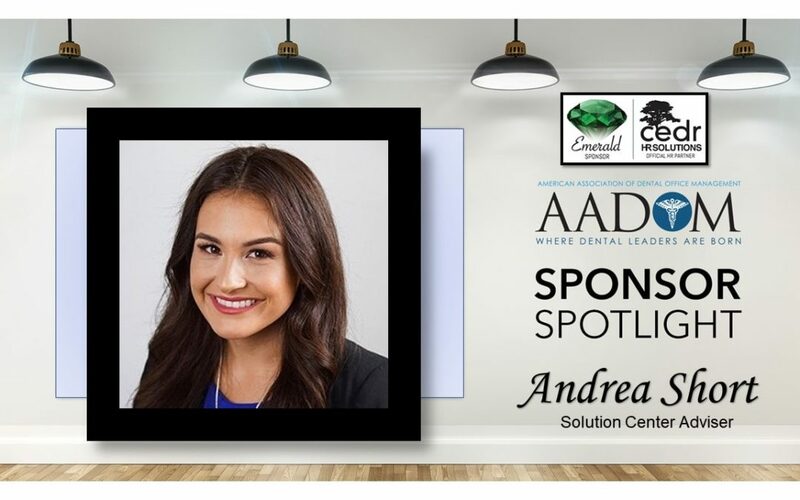 A: Aside from the fabulous people I get to work with, and their awesome annual conference, I really enjoy and appreciate the ability to connect with dentists and office managers. It is so easy to fall into the mindset that any one person can handle their HR issues alone. Employment law is a full-time job, and when your duties span beyond knowing and understanding the law, it is so easy to make a costly employment decision. Working with AADOM is a wonderful way for us to connect with its members to help keep them safe and informed! Q: Tell us something about you we could NEVER guess! A: I once spent three weeks practicing Buddhist meditation at Doi Suthep, a monastery in the mountains of Chang Mai, Thailand. It was three weeks of (almost) pure silence and one of the most transformative experiences of my life! I’m curious by nature and love learning about cultures/religions I haven’t been exposed to. Q: Can you describe the typical AADOM member? A: The typical AADOM member is engaged with their work and has a genuine desire to create a productive and positive working environment. They are committed to their Practice and are focused on its growth and protection. They are difference makers. A: That’s a hard one, AADOM has covered so many topics that I use on a daily basis. Maybe more certifications courses through an online University. Q: Can you tell us about your hobbies/interests? A: I am a self-proclaimed karaoke DIVA! I also spend time creating simple, elaborate, and editorial style makeup looks. Last but not least…I love to cook! I will read several recipes for whatever new dish I am interested in and come up with my own spin! Q: Can you tell us about your experience at the AADOM conference? A: First and foremost, I was blown away by the energy of your conferences! It was so much fun, people are so engaged, and it was incredible meeting and speaking to so many office managers who are at a next level. Some of these managers are our members, so putting faces to names was incredibly satisfying. We speak with our members over the phone, so getting to meet them face to face was a very special experience. Q: Do you or your company support any charitable organizations or events? A: I am a proud supporter of the Hermitage Cat Shelter in Tucson, Arizona. I love all animals, and, one day, I decided to visit a shelter. I was new to Tucson at the time and did a Google search for the nearest animal shelter to the office, so I could occasionally visit the animals on my lunch breaks. Turns out, the nearest shelter was cats only – it is a lovely shelter that provides its cats with clean, open spaces and all the blankets, toys, and hiding spots they could possibly want. And, last year CEDR as a team worked within Sister Jose’s Women’s Shelter here in Tucson. Our Co-founder has formal chef training in his past, and so we donated hundreds of volunteer hours while providing meals to the women in the shelter for several months.